FutureNYC renders what NYC can become when autonomous cars enable us to replace parking and traffic with parks, promenades, playgrounds, event halls, theater spaces, and cafes. Cities should be pleasant environments for people to live and work in. NYC is overtaken by taxis, cars, trucks, vans, and buses. The vehicles cause traffic jams, create noise, and spew pollution. Traffic accidents have caused the city to launch a “Vision Zero” campaign to improve intersections and lower pedestrian deaths. ‍And traffic moves 300% faster. Because autonomous cars, don’t get into accidents, don’t randomly stop or slowdown, and always pull to the side for drop-offs, traffic moves 300% faster. Therefore, we can eliminate cars from half the avenues in NYC and 90% of streets while still getting to to your destination faster than ever. The unused streets become promenades and parks. Eliminating street parking frees up space for drop-offs that enable traffic to flow by, as well as the danger of people darting from between parked cars and being struck. Click to see how traffic moves. Glass coverings protect both pedestrians and cyclists from rain, snow, debris, and ice, while still keeping the streets sunny and open. More people will use green transportation and shop, even in the rain, saving the city millions, keeping vehicle use down, and helping businesses thrive. Intersections are made safer by having wider crosswalks and reducing the crossing distances. Pedestrian boxes are separated by direction, so it will be clear to the autonomous car sensor grid to which corner the pedestrians are intending to walk. Cyclists have their own dedicated turning lanes on the paved area, reducing the complexity of the traffic flow at intersections. Replacing miles of asphalt roads with trees, grass, and planters will create a number of environmental and health benefits for the city. 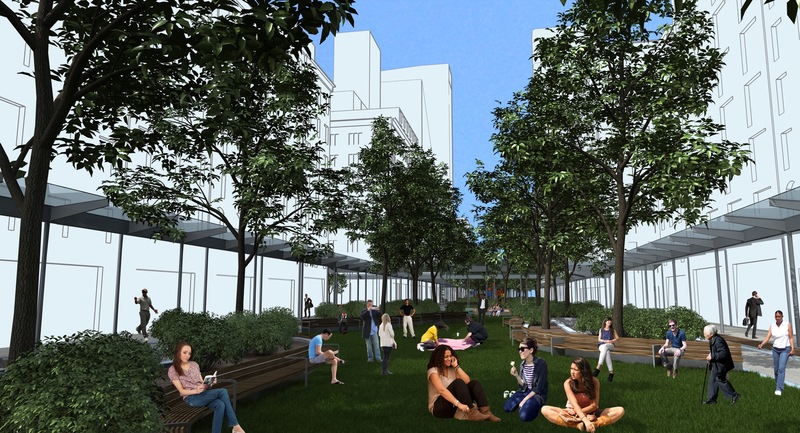 The plants and trees will provide shade to keep the city cool while cleaning the air. The planters will retain storm water, reducing the flooding in subways, sewers and streets. 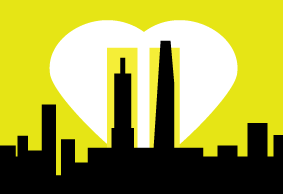 Overall, a better urban environment will be created. Deliveries happen at non-peak hours, and only with electric, autonomous vehicles so residents can finally work, live, and sleep without idling or beeping. Liftgates and lights must be powered by batteries or plug-in power, so engines aren't required inside the city. Robots handle heavy packages, so human delivery teams don't risk harming themselves and others, and unloading/loading happens faster. Delivery vehicles may still have seat for human order-takers, packers, and checkers. All too frequently today, the city’s emergency vehicles get stuck behind traffic caused by human drivers. Autonomous cars will automatically move out of the way of EMS vehicles, enabling them to reach victims three times faster -- a life-saving improvement. When an emergency vehicle needs to access a pedestrian promenade, the automated traffic system clears the path by activating LEDs in the walkway. The blinks and beeps are sufficient to alert pedestrians to move aside, reducing the need for those incredibly loud sirens that make life unpleasant in the city. 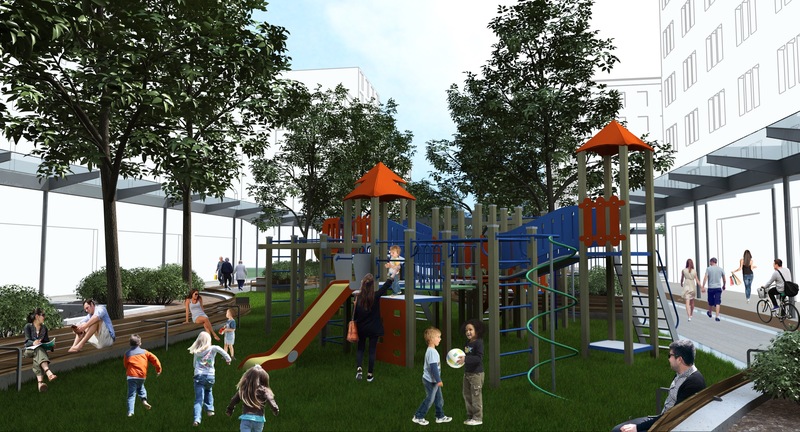 With 9 out of 10 streets and every other avenue returned to pedestrians and cyclists, there’s plenty of room for playgrounds, cafes, seating areas, performance spaces, art instalations, gardens, and picnic areas. Classrooms come outside to learn, local artisans and farmers display their wares, and families and friends (including furry friends) can picnic where trucks used to rumble. People will be able to get door-to-door faster than ever. Traffic will increase in speed because of automated cars that are able to coordinate with one another to prevent jams. The increase in speed will be achieved while improving safety through car sensor systems that can detect pedestrians and cyclists on the road ahead. Unlike human drivers, the sensors will react quickly, and never tire or lose focus. Pedestrian safety will also be improved through better intersection design. Extended sidewalk corners reduce the distance across vehicular streets to a safe, single lane. Separated pedestrian boxes make it easier for sensors to detect which way a pedestrian is crossing. Planted dividers and railings prevent jaywalking that endangers lives and slows traffic. 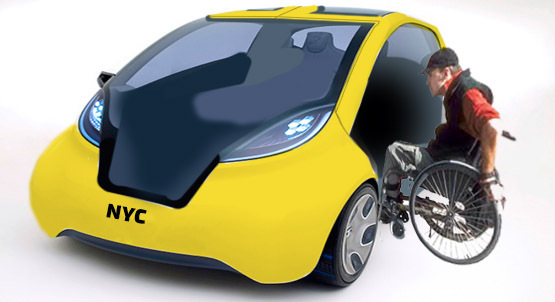 Those with disabilities will be able to grab any taxi and be included in the life of the city with more ease due to all cabs being handicap accessible (see below) and a streetscape without curbs designed to provide universal access. 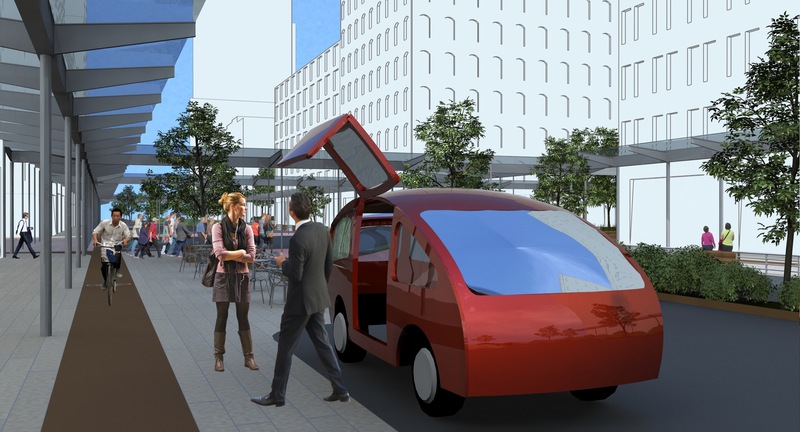 The autonomous cars will constantly be moving around the city picking up new passengers on request. This means there is no more need for on-street parking or garages. These spaces can be transformed into things that will serve people: trees, parks, cafes, bike lanes, theaters, gyms, theaters, classrooms, event spaces, indoor playgrounds, skate parks, bike storage, and more. A few remaining garages will be to converted to automated storage systems that recharge vehicles and hold extra cars for rush hour and peak events. 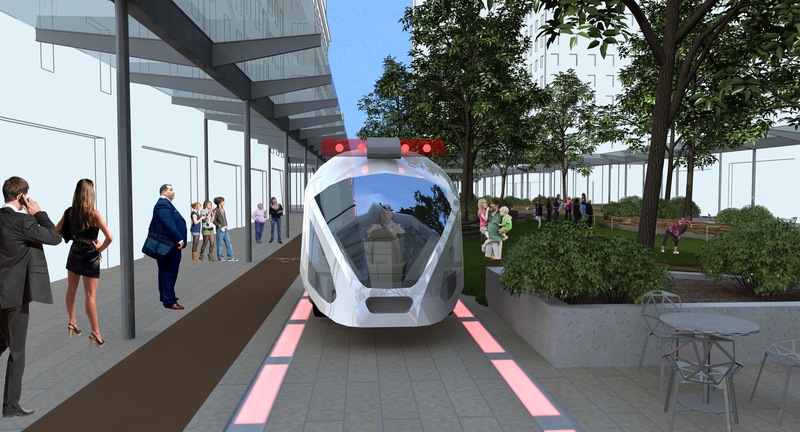 The city's autonomous cars will all be capable of picking up folks in wheelchairs. They drop to the ground on arrival, so those with wheelchairs, walkers, carts, or difficulty climbing can roll right in. The seat bottoms fold up to make extra room for carts, chairs, and even bicycles. Click to explore the new car. Inside NYC: You don’t. There are no manual cars in NYC, not even emergency vehicles (though they have a sort of override). If you’re coming from outside NYC you’ll park your car in an automatic lot and get into a NYCAutoCar or the subway. How do retailers get deliveries? 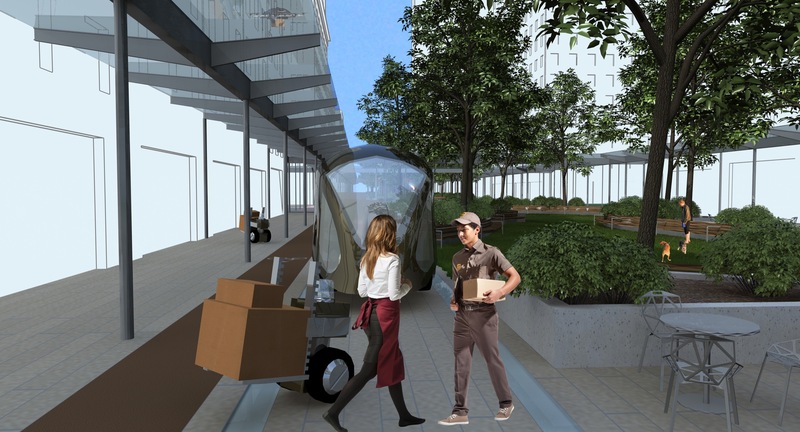 During off-peak autonomous platforms bring delivery pods of varying sizes to retailers, from 4’x’4 to full truck-trailer sizes, from distribution centers outside the city. Retailers can, if they choose, install autonomous pod recievers in the sidewalk (where they currently have trap doors), so they don’t need to be there during those hours. Empty pods will leave, and full ones will arrive while they sleep. What if I need a special vehicle? Sometimes special purpose vehicles may be needed in NYC. These can be brought in atop autonomous pods, eliminating human driving. This will cost a fortune! New York City will save more than this costs in: Medical Costs (Car accidents, Pedestrian Deaths, Slip and Falls, Cyclist crashes, etc. ), Fuel, Cleaning (most cleaning is done by robots), toxic cleanup, etc. New York City will earn more than this costs in increased retail, as people are now able and willing to shop during the rain and snow, and it's more comfortable to walk and shop (a robot will even bring your parcels to your door!). You're nuts! This is impossible! Everything we're proposing is being done successfully in another city, even the car-free streets and self-driving cars. Cool. Email us at join.futureNYC@12gurus.com and let us know how. Ari Teman is an award-winning, patent-holding inventor and designer, technologist, author, and founder of four international organizations. His work has been recognized by The White House, Mayor Bloomberg's office, international press and foundations. He's also a standup comedian seen on TV and clubs in NYC, LA, TLV, and around the world. 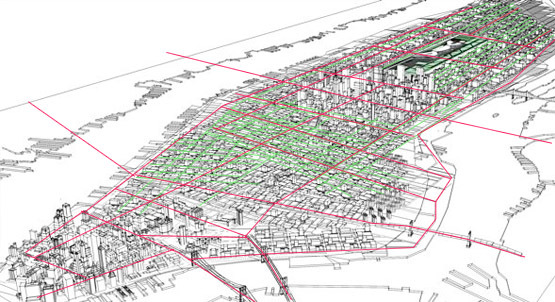 He began to sketch FutureNYC when stuck in a smelly NYC cab going nowhere fast. Friend or Fraud : Cybersecurity using computer vision & deep learning (AI). 12gurus, the strategy and design firm that also hosts 12gurus:Charity and 12gurus:Health innovation conferences. JCorps : The award-winning international volunteer network with thousands of members from over 180 colleges, 800 companies, that operated in 7 cities, across the USA, Canada, and Israel. GatherGrid : Find the best time for a group to meet. Elliot Glassman is an award-winning architect specializing in environmentally conscious design. He holds a Masters degree in sustainability from the Harvard Graduate School of Design. During the course of eight years of professional experience, Elliot has worked on several large-scale projects worldwide, each requiring a particular set of programmatic and climate appropriate design responses. 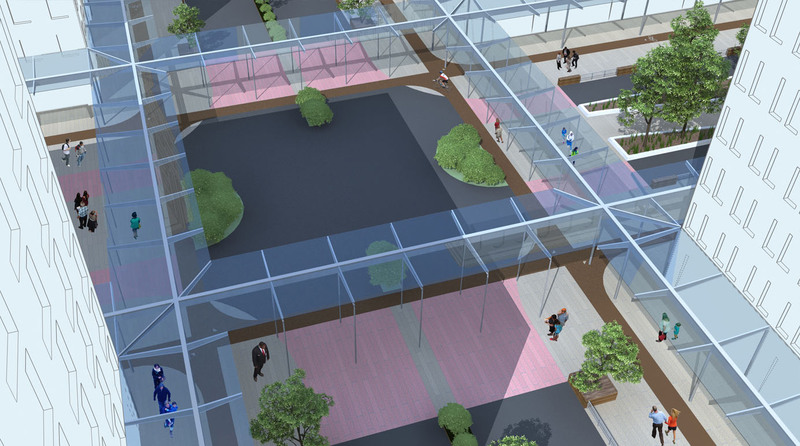 Elliot's work focuses on creating high performance buildings and improving the quality of the urban environment. This leads him to consider issues of energy efficiency, water consumption, access to daylight, indoor and outdoor air quality, and walkability and transportation networks. Elliot believes that both the built and natural environments greatly influence human health and social well-being. Good, ecologically-minded design can be used to make cities more livable, conserve resources, and restore natural ecologies. There is a unique synergy between these environmental goals and the cultural and economic life of cities which is the central generator of the FutureNYC project. All rights reserved. Don't copy or print or share it without crediting us -- including all images. You can hire us, pay us, etc., but you can't just take our ideas. Cheers.